Restaurant A.T is our destination today. We walked past it after Alliance yesterday, the window causing us to stop and peer in, modern and fresh, a departure from the classic Parisian. The space here is simple and contemporary, a soft white space, splashed with small details of colour and texture. Wall art of timber strips splashed with streaks of pastel colours and a modern mural on one wall; black textured sweeps of paint that flash across the wall and ceiling. The table we are seated at is spacious and topped with a black rubberised finish, warm and soft to the touch. Chef Atshushi Tanaka seems to have a gentle spiritual energy. The dishes were presented with a quiet assurance rather than with any bolshy fanfare. For me, receiving the plates with that sort of energy filled me with confidence that I was going to get great pleasure from each dish. We were not disappointed. There is something magical in the marriage between French and Japanese cooking. 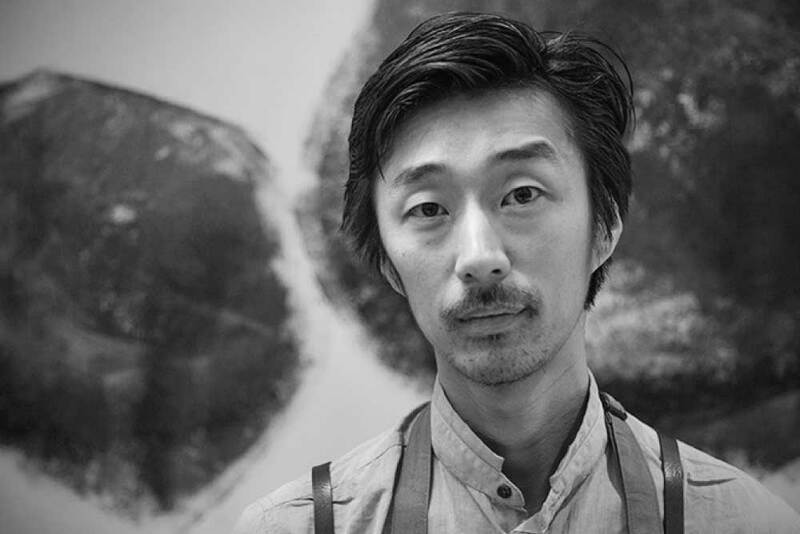 Tanaka San brings technical precision and stunning visual creativity to the richness of the French cuisine. Yet you cannot for a second call Tanaka’s food Japanese or French. He is known by some as the Picasso of the kitchen. The feeling of receiving his creativity on a plate was childlike, like being at a very elegant birthday party with every dish another surprise gift to unwrap. Chef Tanaka’s food was magically light but so rich, despite only having one dish that had a little butter! Thank goodness we had butter for breakfast…..with a little baguette of course. Our first dish in the tasting menu was leek with brown butter. A beautiful tiny stoneware disc held a cylinder full of flavour, decorated beautifully with tiny leaves and petals. Soft greens delicate purples. It felt romantically feminine, a dainty pretty dish and the flavour was exquisite, the sweetness of leek balanced with a nutty buttery warmth. Salsify was next, the slender root vegetable was served, the hairy fine roots still spiralling out along the length of it, holding up tiny purple flower buds. The dish had an honesty, it was completely as nature intended. I love that Tanaka was true to nature and did not feel the need to peel shape and perfect the vegetable to suit the refined idea of a commercial product. He honoured the real perfection that the pretty hairy little thing was supposed to be. It tasted wonderful, sweet and earthy. It was interesting to watch the table next to us where a couple of very pretentious looking folk were painstakingly cutting the hairy dangly bits off their salsify before eating it. I couldn’t help but think they had completely missed the point. The beautiful dishes continued to appear – each such a visual treat. Tanaka’s eye for beauty connected very strongly for me. I have always been inclined to notice beauty in the small things, the way the light reflects off a semi frozen leaf while taking a winter walk; the delicate intricacies of a spider’s web sparkling in the moonlight as I go to lock up the chickens for the night. Tanaka seems to me to have a unique talent for bringing out the subtle beauty and delicate details of the ingredients he works with, showcasing it more overtly on the plate. He makes beauty accessible, offering every one of his customers the opportunity to connect with it. Not everyone sees beauty – but perhaps this is a place where some that have not seen before might finally get to see! The menu continued to flow quietly and assuredly from one dish to the next. Oyster with delicate slices of kohlrabi and beautifully flavoured with Sudachi. The flavours were amazingly complementary. My Oyster of preference is usually straight up natural oyster slurped off the shell. The ever so delicate cabbagey flavour of the kohlrabi and the sour hit of the Japanese sudachi (a lime-like citrus traditionally used in the making of Ponzu sauce) just worked. The element of surprise seems very much part of Tanaka’s intent. “Camouflage” on the menu is a beautiful dark earthenware plate with a mound of crisp purple/black and green shards in the centre. Hiding beneath, waiting to be revealed, is a perfectly cooked piece of sea bream. The textural contrast and flavour of the juniper and parsley shards takes the fish to another level. Another camouflaged surprise is the additional optional dish that can be added to the menu if you choose; Foie Gras. Another exciting plate that starts with uncertain anticipation. Pale grey pieces of shattered Meringue hide the delicate morsel of Foie Gras. Beef, hay and Jerusalem Artichoke a stunningly beautiful dish. A flat black rough glazed disc is the perfect canvas for this work of art. Delicate translucent slivers of raw beef accompanied by Jerusalem Artichoke, pureed, shaved and powdered have been flavoured with smoking hay. Dainty white petals and micro herbs are the finishing touches to this pretty plate. The scallops with celeriac have been lightly flavoured with the very French unique tang of bergamot, a citrus more golden than yellow and sweeter than a lemon. Red Mullet with Romanesco arrives. The bright green of the Romanesco popping against the deep green of the bowl. I remember the excitement of finding this amazing vegetable at the markets. The mullet sits, red skin side up, on a bed of little cockles. Pigeon and beetroot is the final savoury dish. Against the creamy whiteness of a large flat plate, deep purple of beets and dark juicy pink carved pigeon are a striking contrast. Three small pieces of pigeon including a leg complete with crispy curled claw are glossy with a golden jus. The composition has the fascination of a surrealist painting. Throughout our meal we have enjoyed a fascinating wine journey. Tanaka has made a very bold choice and decided that natural (organic) wines will feature in his restaurant. So much so that he also runs a little Bar a Vin in the cellar where he serves small bites, hams, saussion, cheeses and lovely natural wines. The wines were such a departure from what we have had so far in Paris. Some cloudy and unrefined some big and bold. I think the most fascinating wine for me though, has been the 2005 Podere Pradarolo. A still white wine from Italy made using very traditional, long and intensive winemaking methods. It has a beautiful deep amber glow almost like a rose but deeper. It has a very robust almost sweet nose reminiscent of a fortified wine. Expecting that sherry like flavour I am completely surprised to taste a beautiful clean dry crisp white wine. Amazing! I just have to figure where I can buy this stuff at home. Our dessert courses start with Tanaka’s signature Blueberry, Hinoki, Jamaican pepper dessert. All the elements are the same soft bluish grey hue, with various tones strikingly arranged on the dark plate. The blueberry cake is hidden beneath a milk crumble coloured with charcoal. A perfect quenelle of Hinoki icecream is placed on top and Hinoki cream is printed onto the plate in the most intriguing pattern. I have contemplated that pattern for hours since. As with most art the artist’s intent is not always the same as the viewer’s interpretation. Is Tanaka trying to portray roots growing down below the earth, or the branches of a deciduous tree reaching upward, or given that it is grey is it the neuro tentacles in our brains? The use of Hinoki is fascinating. Tanaka infuses the milk for the icecream and cream with Hinoki chips. Hinoki is a type of Cyprus tree from Japan. The wood is highly prized as building timber while the oil is considered to give an invigorating citrus aroma that is historically used to increase spiritual awareness and refresh the soul. Perhaps the imagery of the dish is a nod to the Hinoki tree? A final dessert of Apple Quince and pine brings todays journey to an end. We are the last in the restaurant having taken our time to savour every element, listening, looking, smelling, touching and tasting. We bid Tanaka farewell at the kitchen door and he immediately rushes out to see us out. I feel his genuine gratitude for our participation in his expression of creativity and I am certainly deeply in appreciation for having had this amazing opportunity. All my senses have been stimulated and my soul has definitely been refreshed.